Erik Jekabson is a trumpet player, composer, arranger and educator. 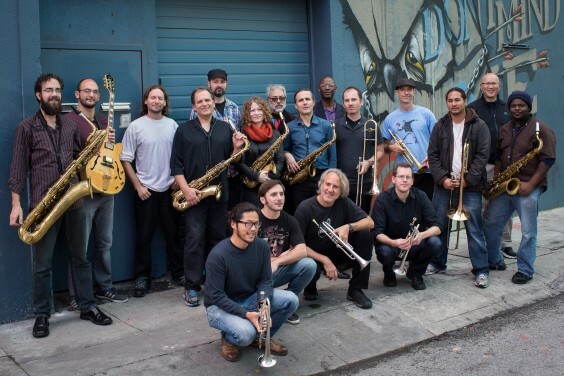 He performs throughout the Bay Area as a bandleader with his many groups, and as a freelancer. In 1996 a friend recommended that Erik join the jazz funk jam band, Galactic. For a few years he was one of their regular horn players and ended up writing their horn charts, many of which ended up on their first album. He still receives payments from those recordings. In 1999, Erik took the plunge and moved to New York. “New York was astronomically bigger than New Orleans. I knew a ton of people there from New Orleans and Oberlin and joined what they were already hooked into.” He joined Local 802 and established himself on the wedding band scene, working with the Hank Lane Club Date Agency. “They made an agreement with the union, so they were union gigs, top 40 stuff, bar mitzvahs and weddings on Long Island.” Erik lived with two other musicians in Brooklyn where they had jam sessions during the day at their apartment. He was able to scratch out a living from music but had to take a day job after 9/11. Erik ended up taking a leave of absence from the conservatory. The tour turned out to be 5 six-week tours with a month off in between. Erik Jekabson, Mary Fettig and Dave Eshelman performing with the California Jazz Conservatory Studio Band, a band made up of top High School players from around the Bay Area. Erik has produced three CDs since returning to the Bay Area, all on his own record label, Jekab’s Music. “Crescent Boulevard” (2009) features small group modern jazz, “Anti-Mass” (2011) features string-tet (trumpet, sax, violin, viola, bass, drums, vibes) playing his original compositions inspired by artwork at the DeYoung museum and has classical, jazz and avant-garde influences, and “Erik Jekabson Quartet and John Santos: Live at the Hillside Club” (2013) is a live concert featuring his quartet with special guest percussionist John Santos. Both “Anti-Mass” and “Live at the Hillside Club” were made possible by a grant from SF Friends of Chamber Music.